Truffles are a wild fungus that grow in the ground however for them to grow in general, the ground must have certain properties. In fact, depending on what kind of soil the truffles grow in also depicts their shape. Smooth truffles grow in soft soil, and the lumpy, knotty truffles come from soil that is more compact. Pour 5-6 cups of water into a pot and bring to a simmer. Heat the butter in another pot over medium-high heat and saute the shallots for 2-3 minutes. Do not let them brown. Add the rice and stir well, then cook for 1-2 minutes, until the rice is well coated and hot. Pour in the white wine and bring to a strong boil. Stir often and let this cook down. When it is almost dry, pour in 2 ladles’ worth of the simmering water and sprinkle about a teaspoon of salt over the rice. Stir constantly until this has almost boiled away. Add 2 more ladles’ worth of the water and continue. Repeat until the rice is al dente. Taste for salt and add some if needed. Pour in a little more water and stir in the Parmigiano cheese. Let this cook for 1-2 minutes, stirring often. Turn off the heat and stir in the truffle oil. Use as much as you want, but at least a couple tablespoons. Serve in shallow bowls and shave the truffle over the top at the last moment. 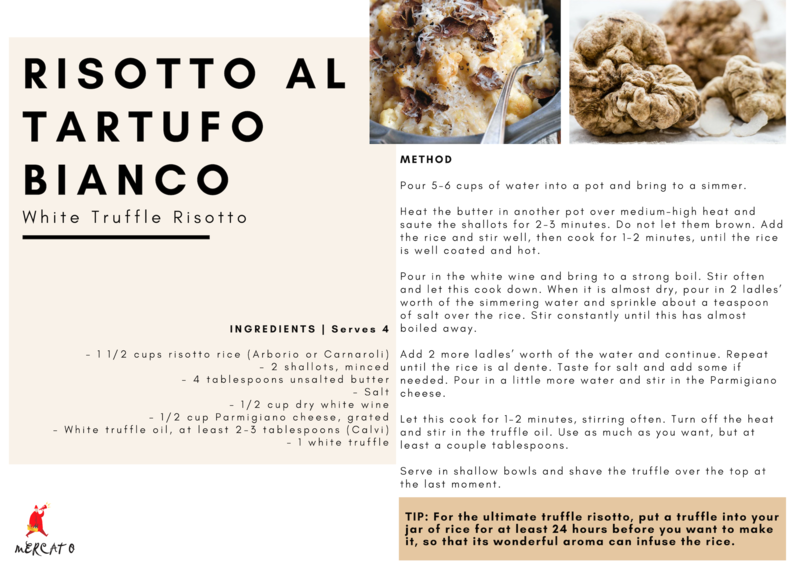 TIP: For the ultimate truffle risotto, put a truffle into your jar of rice for at least 24 hours before you want to make it, so that its wonderful aroma can infuse the rice.